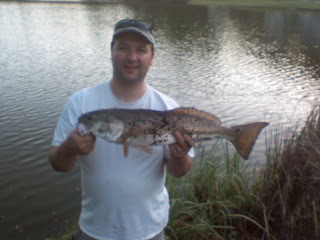 Here are some other fish we caught in the saltwater ponds there. Sunday I had a group of 6. We took the pontoon so we would have enough room for all of us and it work out nice. 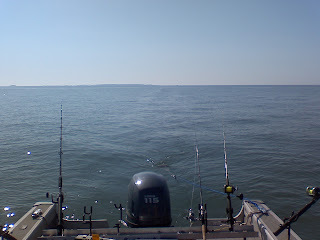 We have beautiful weather and some great fishing. 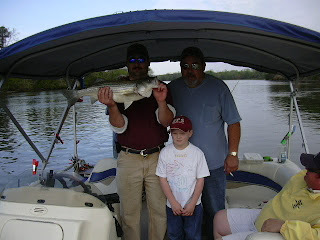 We started out getting some fresh bait and as usual it was pretty easy to get. We caught a couple stripers and small cats at our first spot. We sat here for a few hours because we were catching fish and bait and it was a fun spot. 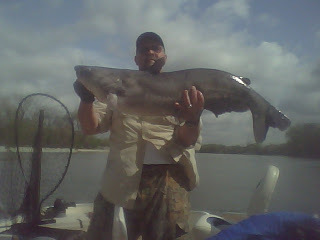 Around 1030 we headed down river a little ways and as soon as we got the baits in the water we hooked up with our biggest cat of the day. He was 55 pounds. 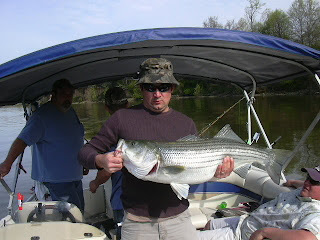 A little while later we cught another striper and a 25 pound cat. 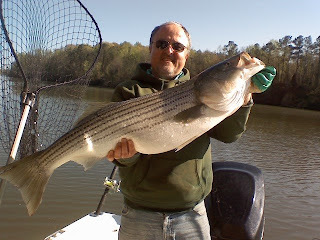 Our totals for the day were 7-8 cats under 10 pounds 23, 25 and 55 pound Blue Catfish and 10, 21, 24 and 32 pound Stripers. Day 1: We started out getting some fresh live bait to try for flatheads. 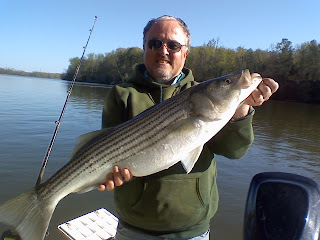 We had also planned on doing some hickory shad fishing. Well while we were catching bait I realized that one of my shad reels was messing up. I called my dad and asked him to bring me another. So we stopped at a pretty good spot to "kill time" while we were waiting. Well in the 15-20 minutes we sat there we had two fish. 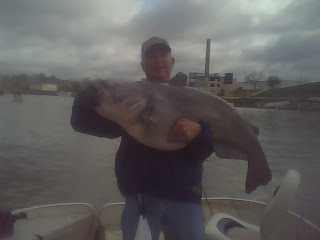 After about 5 minutes we had our first blue cat that weighed in at 36 pounds. 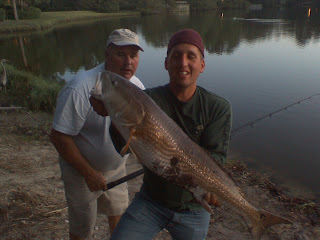 Not 10 minutes later we had our second one that ended up being the biggest for the 2 days He weighed in at 55 pounds. What a great way to start the trip! 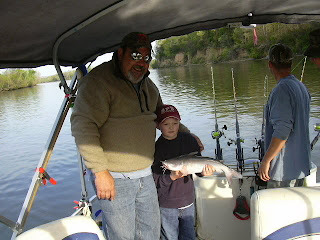 After that we headed up river and caught a few Hickory shad. We didn't catch a lot of them but it was a cold and rainy day so it was sort of expected. We caught plenty of herring though and they are a lot of fun. We spent probably 4 hours trying to get on a flathead. We had no problem getting them to bite but we could not get hooked up. 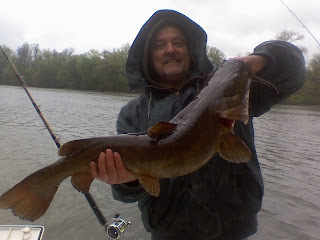 We did eventualy land this 15 pound flathead. In our search for a big flathead we had two very dissappointing things happen and both at the same spot. We had one rod with the bait clicker on with a live bait on it and out of no where this thing got hammered!! Don't know how but the hook didn't stick and we lost it. 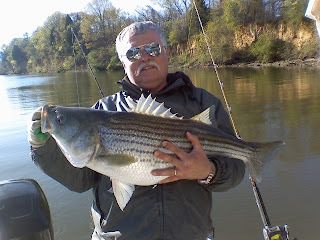 Probably a big striper. Then later we had one of our cat rods get hit and it was one of the hardest hits I've ever seen. I'm pretty sure it was a Blue cat that hit. I'll take the blame on this one, apparently when I was checking the drags I missed this one. When this fish hit, the rod slammed down so hard the line snapped and about 20 feet of line came flying back into the boat like a whip. We had a few other small fish that day but nothing too exciting. 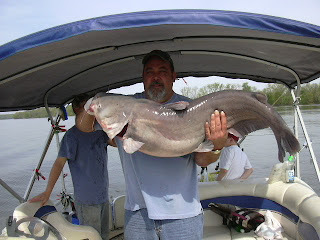 Day two was to be our big catfish day. Long story short that didn't work out as planned. It was supposed to blow 10 - 15mph. It was more like steady 20-25. My downriver spots were unfishable. We tried them anyway which was a waste of time. We worked our way back up river steadily hitting good spots that were out of the wind along the way. Nothing was happening, just fish 10 and under. About 3:30 I decided I was going to go all the way back up river and get some fresh bait and start over. 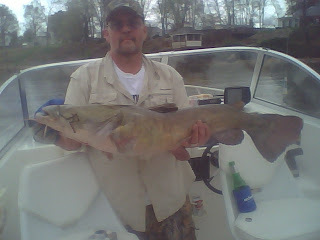 We got the bait and minutes after got this 18 pound Flathead and some more small blues. The we tried the spot that produced the big fish the day before with no luck. 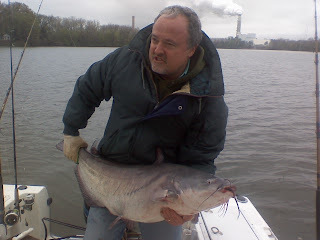 In a last ditch effort I headed a few miles down river to a spot that I have caught some stripers in the past and is also good for cats. Well this turned out to be a great move. 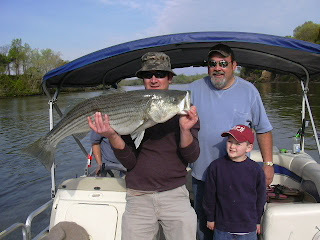 With in minutes of putting out bait Neil was fighting with his first striper that came in at 23 pounds. After that his brother got his first stiper that was 21 pounds. Over the next hour we caught 6 stripers totaling 111 pounds. 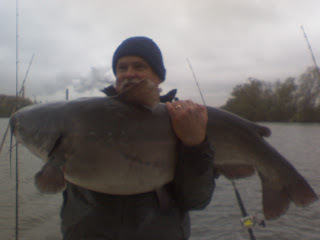 We had fish of 10, 12, 20, 21, 23 and 25 pounds. 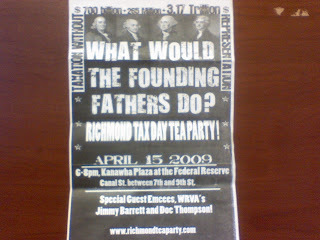 This was a lot of fun. We missed a bunch of fish during this stretch too. We had one break off and a couple drop the bait as they ran with it. A lot of fun though. Thanks again guys for coming from so far away to fish. I just figured out by using this new blog to post reports I can post pictures of what we catch from my phone! Pretty cool. So in the future when I'm out on the river catching some good fish I'll try and remember to take a picture with my phone and send it here. 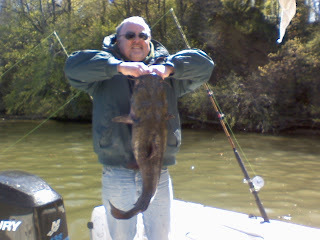 This is a flathead Capt. Joe caught today.